Looking abroad for ways to reduce the number of shootings in America doesn’t offer easy solutions. Australia and Great Britain made extensive changes in gun policy in response to mass shootings two decades ago, and there has only been one mass shooting in either place since. Other countries also have tightened gun laws after similar tragedies, leaving some Americans wondering if similar changes here could have prevented the shooting in an Orlando gay night club last month that killed 49 people. President Obama has held up Great Britain and Australia as models for what we might try, and Hillary Clinton has said on the campaign trail that Australia’s ban and buyback model is worth considering. But it can be hard to measure how well these reforms have done at preventing mass shootings and other gun violence. And it is hard to predict what would happen if those measures were enacted in the U.S., which has a different relationship to firearms to begin with: We offer firm legal protections for gun ownership, and far more Americans own far more guns. The apparent frequency of mass shootings (those claiming at least four lives other than the shooter’s, by most definitions) in the U.S. prompts envy of other nations’ relative lack of them. 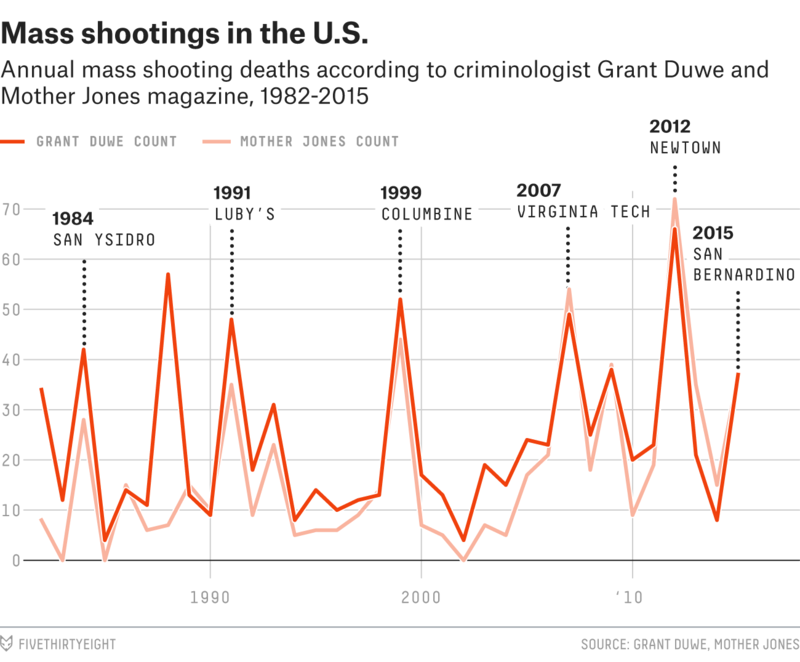 And according to two independent counts (one from criminologist Grant Duwe of the Minnesota Department of Corrections and the other from Mother Jones magazine), public mass shootings have become slightly more common — and deadly — in the U.S. But mass shootings still account for only a small fraction of the roughly 8,000 gun murder incidents in the U.S. each year.1 This suggests that measures aimed at preventing mass shootings would save more lives if they also prevent other kinds of gun death. Reforms that came in the wake of mass shootings in other countries come in a range of approaches, sometimes tightening access to all guns and sometimes banning guns with specific features. In New Zealand, after a man went on a shooting rampage at a neighbor’s house in 1990 and fatally shot 11 people, the country stopped offering lifetime licenses for guns, requiring gun owners to renew their permits every 10 years instead. Military-style weapons were not banned but required a special permit. After a 22-year-old gunman killed 10 students at a hospitality school and then took his own life in 2008, Finland raised the minimum age to own a gun (from 18 to 20) and added requirements to own a handgun (such as two years of supervised target practice and membership in a gun club). Canada and Germany also tightened access to guns after mass shootings within their borders. These laws made buying a gun more difficult, but they did not substantially change what kinds of guns were legal to own in these countries. In some cases, as with Finland’s requirement of two years of training, they may have deterred potential killers who would have put together their plans quickly, but it is hard to know how many potential shooters fall into that category. Great Britain and Australia both enacted much broader reforms in response to mass shootings. Both banned certain guns that had previously been legal and bought them back from gun owners. After a gunman armed with two handguns killed 15 students and their teacher in a Scotland school in 1996, Great Britain banned semi-automatic weapons and handguns.2 In the same year, a gunman in Australia killed 35 people at a tourist site. In response, the country banned some semi-automatic and self-loading rifles. Owners of banned weapons were supposed to turn them in for compensation. The country put new restrictions on gun buyers, who now need to give a “genuine reason” for owning a gun (and “self defense” doesn’t count). Did Australia and Great Britain’s reforms prevent mass shootings? 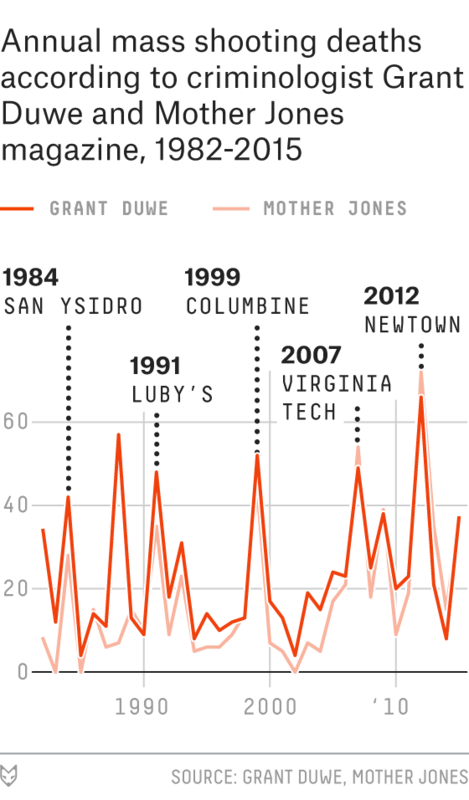 It’s hard to say, simply because mass shootings are relatively rare. In the post-buyback period, Great Britain has had one massacre with guns while Australia has had none. It’s hard to calculate how many would have been expected without a ban. Australia looks more successful in this regard, because it had more frequent mass shootings before the ban (averaging about two mass shootings every three years from 1979 to 1996.3) Mass shootings in Great Britain, prior to the ban, were rarer. Prior to 1996, there hadn’t been a widely covered mass shooting in Britain since 1987. It’s hard even to calculate how successful the bans were at getting powerful guns out of private hands. Neither Great Britain nor Australia had a registry of guns before the new laws, so, although the governments can report how many guns they collected, it’s difficult to estimate how many guns people kept when they were supposed to turn them in. In Australia, estimates of the share of guns collected range from 40 to 80 percent of the guns sought. It is difficult to find any estimate of what percentage of guns Great Britain managed to recover; instead most reports cite the raw numbers of guns turned in. What matters isn’t just how many guns are turned in, but who is turning them in. Critics of buyback programs argue that law-abiding people are the most likely to turn in their guns so a buyback may only recover guns least likely to be used in a crime. So to gauge the effect of a restriction and buyback program, it might make more sense to look at trends in gun violence and suicide, and see if a new law has caused a drop. In parts of Great Britain, there isn’t strong evidence the ban and buyback saved lives. After the new gun law was implemented in 1996, the number of crimes involving guns in England and Wales kept rising through the 1990s, peaking in 2003 and 2004 before subsiding. The post-2004 drop is hard to credit to the buyback and possibly occurred because of an increase in the number of police officers. It’s possible that any effect of the ban, positive or negative, was swamped by other factors affecting gun violence. There has been one notable mass shooting in Great Britain since the law was passed, making it hard to judge whether the law has been a success in that respect. In Australia, homicides declined after the ban and buyback, but homicides had already been falling, according to a 2003 analysis by criminologists Peter Reuter and Jenny Mouzos. The share of robberies and suicides committed with a gun declined, but the researchers found that the overall data was “consistent with a story of substitution” — meaning people used other weapons for homicide and suicide. Through 1998, the number of suicides (normalized by age) remained nearly constant, and the share of suicides using a firearm fell by the same rate it had been falling before the ban. Armed robberies increased through 2000, though fewer were conducted with a gun. Causing criminals and potential suicide victims to reach for a different weapon could be a partial victory for a buyback program. Most alternative weapons are less lethal than a firearm. But if that happened, it didn’t appear to change the overall trend for violent deaths. Reuter and Mouzos only had a few years of post-ban data to judge, but last month, a more recent study of Australia’s gun buyback program published in the Journal of the American Medical Association still found only muted results. After the ban, firearm deaths (which were already declining) fell faster than they had before the ban. However, non-firearm suicides and homicides also fell, and even more sharply, in the aftermath of the ban than firearm deaths did, making it hard to tell if the trend in firearm deaths was the result of the ban or if all suicides and homicides were falling for a different reason. Because non-firearm suicides and homicides fell after the ban, the researchers found it unlikely that Australians who tended toward suicide or homicide simply switched methods after the ban. If they had, the number of deaths by suicide and homicide without guns should have risen. Overall, the effects of Britain’s and Australia’s gun buybacks aren’t as clear as headlines after U.S. mass shootings suggest when urging U.S. officials to follow their lead. Some of the possible positive effects — in particular, a reduction in mass shootings — are hard to measure because the phenomenon itself is rare before and after. When it comes to gun homicides and suicides, neither reform has a clear, positive record. Any success Australia and Great Britain had reducing gun deaths would be hard to replicate in the U.S., because of how it differs from those places before their bans. One of the most obvious differences is that these other nations are islands. Smuggling in illegal guns is harder in places like Australia and Great Britain because they don’t have land borders. The U.S. also has far more guns already within its borders; as of 2009, the Bureau of Alcohol, Firearms and Tobacco estimated there were more than 300 million guns in America. There’s another important difference between the U.S. and other countries when it comes to guns. Neither Britain nor Australia has anything like the Second Amendment, so many parts of their reforms, from total bans to requiring a reason for gun ownership, might not survive judicial review in the U.S. — if there were ever the political will to make them laws in the first place. CORRECTION (July 14, 1 p.m.): An earlier version of this article incorrectly listed Norway among the countries that tightened access to guns after mass shootings within their borders. After a 2011 gun massacre in Norway, an independent commission recommended tightening the country’s gun laws, but the recommendations were not adopted. The term “murder” in this sentence and in the following chart refers to murder and non-negligent manslaughter. These incidents averaged 8,017 between 2012 and 2014, according to the FBI’s Supplementary Homicide Reports, which the bureau compiles from reports from local law-enforcement agencies and makes available via the National Archive of Criminal Justice Data. Northern Ireland is exempted, in all or in part, from many British gun laws. 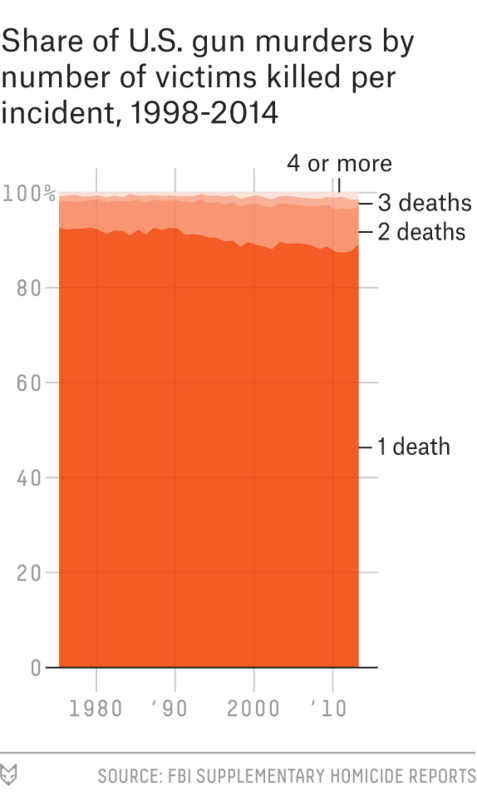 This figure is based on a more stringent definition of mass shooting: five or more people killed (not counting the shooter) rather than the more common four or more definition.